The strategy for Inclusion in Cornwall sets out the priorities and objectives for the next 3 years. 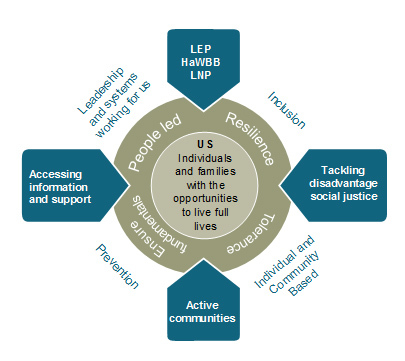 The full document is available Inclusion Strategy for Cornwall 2015 Revised and is summarised in the diagram below. The Strategy will be reviewed in 2018. 17 of Cornwall’s neighbourhoods are in the most deprived (worst 10%) in England. This places Cornwall 143 out of 326 local authorities in England (1 is most deprived). The previous IMD data (2010) identified 8 of Cornwall’s neighbourhoods as being among the most deprived in England. 75% of people over 75 are suffering from a chronic illness of which 45% have more than one condition (Cornwall and Isles of Scilly). 21.36% of the population stated their day to day activities were limited, this doubles the National figure. Life expectancy has continued to increase in Cornwall from 79.2 to 79.5 years for men and from 83.3 to 83.5 years for women (08-10) compared to 09-11) The inequalities gap for life expectancy is closing, down from 5.9 to 5.3 years (men) and from 5.2 to 4.4 years (women), 08-10 compared to 09-11. Cornwall is ranked 46th out of 150 local authorities  for premature deaths. Women working full time are paid less than men in 90% of sectors, with those working in financial and insurance sectors among the worst affected, research shows. The report, Opportunities and outcomes in education and work: Gender effects, released today by the UK Commission for Employment and Skills (UKCES), examines the impact of gender on a range of education and employment outcomes. The research finds that male workers are paid on average 19% more than female counterparts in almost all areas of the workforce. Strategic influence is important for championing inclusion. The need for an Inclusion Strategy is in itself a recognition that Inclusion is not fully embedded or impacted in policy and strategy development at national or local level. The need to influence the strategies of other services, organisations and departments is key. Here are some are examples where Inclusion Cornwall and partners have influenced strategy to achieve more inclusive service delivery. Cornwall Works Conversations: Building on the success of the role that Inclusion Cornwall played in the Winter Wellbeing programme, an approach was made to Cornwall Council to embed “Cornwall Works Conversations” into the process of applying for discretionary payments through the Revenue and Benefits team. The conversations, conducted by the Cornwall Works Hub team aim to get to the underlying reasons for the need to claim discretionary payments and to plug people into relevant support to prevent the need for future applications.